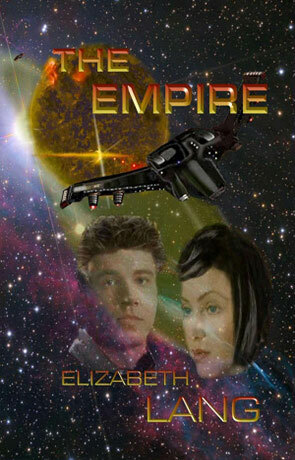 The Empire is a science fiction space opera by Elizabeth Lang. The Centuries old war with Andromedans is heating up and the Empire is the only force that can stand it's way. One brilliant scientist may hold the key to a weapon that could swing the tide and save the galaxy but the method's of the Empire cause doubt that humanity is really worth saving. The Empire is a very mature and powerful space opera that isn't afraid to show the reader the effects of a ruthless and power hungry empire, especially when threatened with extinction by an alien race. This does include fairly graphic scenes of torture and as such isn't recommended for younger readers. The story is very much character driven from the point of view of the main protagonists Adrian, Kali and Bryce. Adrian is a gifted scientist and one of the most intelligent people in the empire. At such a intellectual level he is seen as a valuable asset and is a used as a tool of the Empire, something he constantly rails against. Unable to relate to most people and unwilling to suffer fools, he is very much a loner and miss-understood by most, he has absolutely no social skills and has serious physiological issues with authority, and just about everyone else really. His only "friends" are Kali, a telepathic alien who is hopelessly in love with him and Bryce, a lovable rogue who was destined for a life of drudgery or servitude until Adrian makes him his PA, a new found freedom that Bryce doesn't hesitate to make the most of. The main themes running through the book include human oppression and the effects of torture, politics, the ideology that the end justifies the means and of course the exploration of the human condition. It's a very well thought out and intriguing story, with richly detailed and complex characters that really do draw the attention. The lack of emotion in the principal protagonist does at first make the novel harder to read than otherwise but once you realise that this is part of the character and doesn't stem a lack of writing ability it becomes clear that the surrounding characters are used to emphasis this rigid emotional control that is deeply ingrained in Adrian's psyche. This does actually work surprisingly well, helped by the clear and uncluttered dialog. The Empire is a proficient novel of depth and imagination, a nice slant on the space opera that is driven by character rather than plot and a breath of fresh air in a crowded genre. Written on 16th February 2011 by Ant.